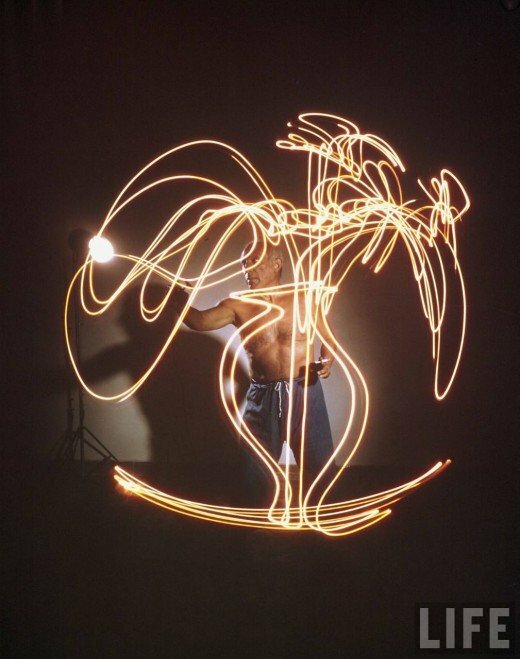 The other day I came across some images from Life Magazine, showing Picasso drawing with light. 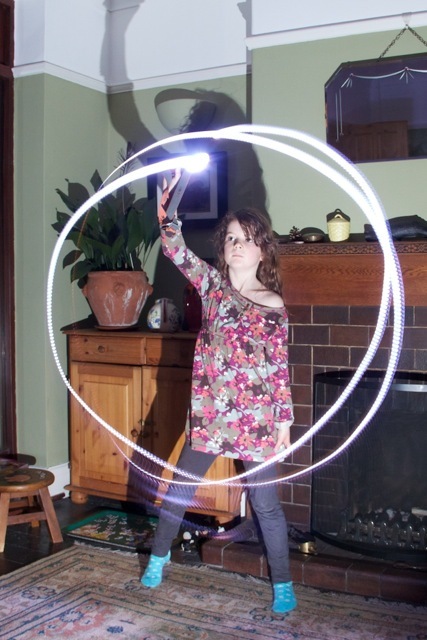 It looked like a fun project, and since my daughter is currently studying light at school, I persuaded her to play along. The result is above. 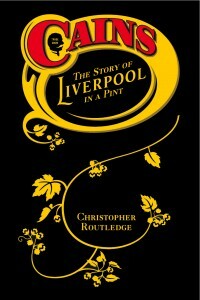 A few people have asked how we did it so I thought I would write a brief “How to”. It’s not difficult, but you will need some specific equipment to make this work. A camera with manual controls. Specifically, you must be able to control the shutter speed, and preferably also switch off the autofocus. Some sort of off-camera flash. I used another camera. A torch or other light source. A certain amount of patience. We didn’t get this right first time. You need to put a camera on a tripod, or some sort of stable surface, and set the exposure to, say, 10 seconds, or however long you think you will need. Manually focus on the subject. It helps if you can do this so that the camera doesn’t ‘hunt’ while it tries to find something to focus on. It also helps to set the ‘ISO’ ‘film speed’ number, rather than leave it on Auto. We settled on ISO 1600, but you will need to experiment with your setup. Get your off camera flash ready. You will need to experiment with placing it to get the best result. In the image above the flash came from below and to the right, casting a nice big shadow on the wall. If you don’t have a flash gun of some kind, you can use another camera. You’ll need to experiment with making that work. Some cameras use a red light to assist the autofocus, while others strobe the flash. You need to switch all that off somehow. Switch off all the lights, and in darkness, open the shutter. At this point the subject waves the light about. Arrange beforehand where your subject’s hand will stop. When she or he reaches that point, fire the flash, which exposes the rest of the room. Everyone then holds still until the shutter closes. It took some experimenting to get the ISO right, and the positioning of the flash, but most important is to communicate while the shutter is open and you are floundering around in the dark. If we do it again we’ll use a less bright light I think. We had a lot of fun with this experiment, and I think the picture has come out pretty well. To see what is possible when a great photographer and a great artist come together to do this, take a look at the efforts of Gjon Mili and Pablo Picasso below. We had to experiment a lot to get this right, but of course in 1949, they were working with film. More Picasso images at Retronaut.